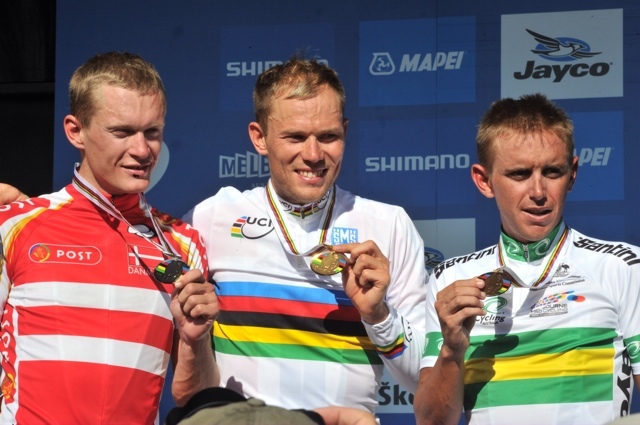 After all the debate, it did come down to a sprint in Geelong and Thor Hushovd, who had kept himself hidden away expertly all day, summoned up the strength to clinch the rainbow jersey ahead of Matti Breschel and Allan Davis. 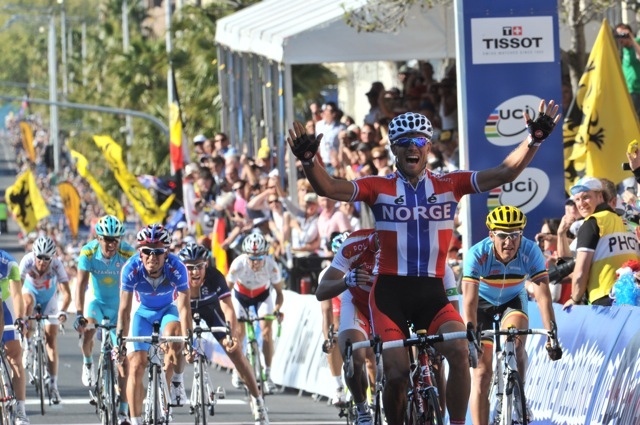 Hushovd became the first Norwegian to win the World Championship road race and by doing so he proved that a numerical disadvantage need not be a handicap. He had just two team-mates to call upon but he used his experience and a cool head to sit tight and hope the other countries would bring it back together in the final kilometre. And that is what happened, although the picture was constantly changing throughout a gripping final couple of laps. The World Championship road race is always a race in search of a move that proves to be The One but this particular event turned out to be an indecisive temptress. That allowed the entire race to concertina back together in the final few hundred metres. Next season Hushovd will ride for Garmin-Cervélo and he said his dream now was to win Paris-Roubaix in the rainbow jersey. The idea of combining rainbow stripes and argyle may well give the Garmin-Cervélo jersey designers a headache. Philippe Gilbert, the pre-race favourite, attacked hard on the final lap and looked like he might stay away, only to be caught inside the last two kilometres. And the Italians, who dictated so much of the race and had such strength in numbers at times, will be disappointed Filippo Pozzato could manage only fourth. Cadel Evans put up a spirited defence of his rainbow jersey with a typically aggressive performance in front of his home crowd. However, it is Hushovd who will have the honour of wearing the iconic jersey for the next 12 months, although there were long periods during the race when it looked unlikely the sprinters would have a look in. Admittedly, the sprinters who came to the fore in the finishing straight were of the more durable variety. 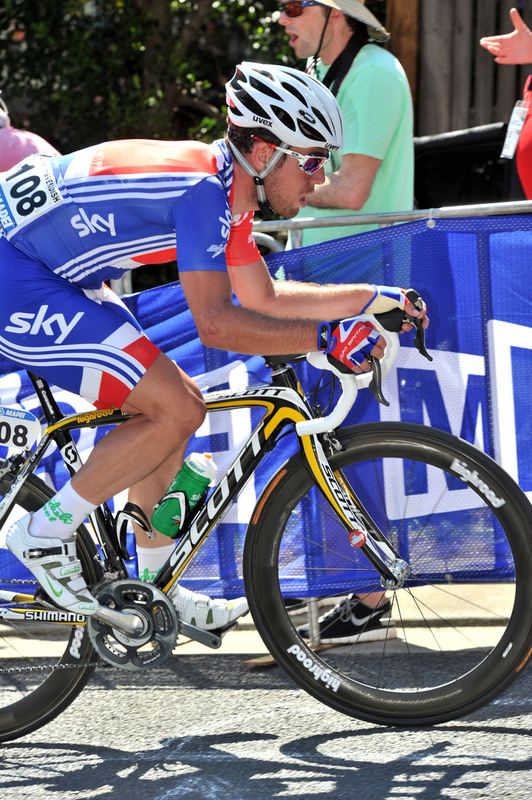 Britain’s Mark Cavendish, who pulled out with around four laps to go, and the American Tyler Farrar, were not there. A group of 40 had started the final 15.9-kilometre lap together and 25 were still in contention in the last kilometre, suggesting that the course was not as selective as some had suggested, but also proving that the World Championship road race is a game of risk and reward. As they rolled out of Melbourne for a run of 80 kilometres or so to the circuit in Geelong the peloton was no doubt relieved the predicted crosswind was not blowing. Thoughts of grovelling in the gutter for a couple of hours before even reaching the hills had some fearing this could be a classic war of attrition. There was an attack as soon as the race left the neutralised zone. Liverpool-born Matt Brammeier, riding for Ireland, was one of those to go clear. He was joined by Colombia’s Diego Alejandro Ramayo Martinez, Mohammed Said Elammoury (Morocco), Jackson Rodriguez (Venezuela) and Oleksander Kvachuk (Ukraine). A Serbian, Esad Hasanovic, tried to get across the gap but made no headway. The leading five riders were allowed a lot of headway. Almost too much. By the time they reached the circuit they had a lead of almost 23 minutes and were just completing their first lap as the bunch arrived. Had the two groups been in the same place at the same time it would have been fascinating to see what the race officials would have done. Would they have forced the five leaders to stay apart from the peloton, or would they have been allowed to ride into the safety of the bunch and enjoy the ride? Fortunately that farcical situation did not arise. For the first six of 11 laps of the Geelong circuit, the race settled into what appeared to be a processional lull but was in fact just the beginning of the long attritional process. The gap came down but with six laps to go the leaders – who were now four, having dropped the Moroccan Elammoury – were still seven minutes clear. On the big climb of The Ridge with five laps to go the race caught fire. A group of 32 riders went clear, with some of the big favourites in it. 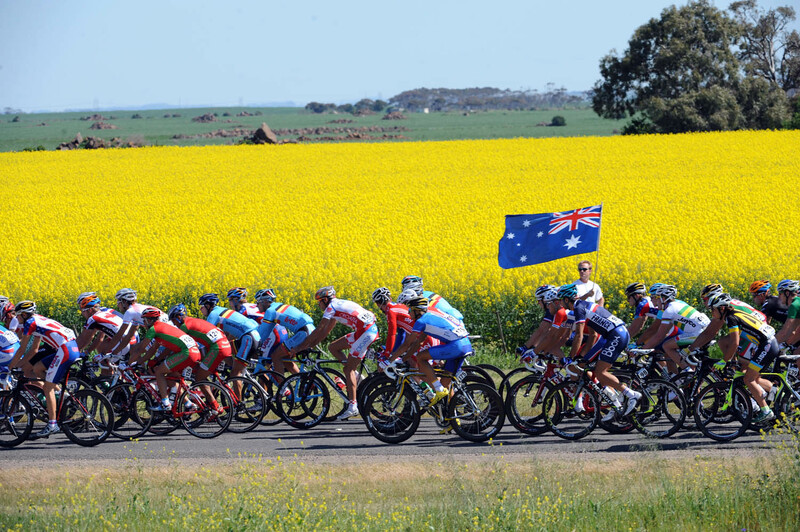 The Australians had Cadel Evans, Simon Gerrans and Stuart O’Grady. Italy and five riders, Vincenzo Nibali, Filippo Pozzato, Matteo Tossato, Giovanni Visconti and Francesco Gavazzi, Belgium had four, Philippe Gilbert, Leif Hoste, Jurgen Roelandts and Greg Van Avermaet. The other riders included Tejay Van Garderen (USA), Wout Poels, Lars Boom and Koos Moerenhout (Netherlands), Andre Greipel, Fabian Wegmann and Tony Martin (Germany), Pavel Brutt and Yuriy Trofimov (Russia), Edvald Boasson Hagen (Norway), Michael Albasini and Steve Morabito (Switzerland), Yoann Offredo (France), Gorazd Stangelj (Slovenia), Nicolas Roche (Ireland), Chris Anker Sorensen (Denmark), Jose Serpa (Colombia). The Spaniards had Haimar Zubeldia, Ruben Plaza and Carlos Barredo, not quite the trio they would have hoped for, and that contributed to the lead being kept under control despite the size, power and commitment of the group. With four laps to go, the Ukrainian Kvachuk was the only survivor from the lead group and his crossed the finish line with a lead of 5-56 over the 32-man group. It was at that point we heard Britain’s Mark Cavendish and Jeremy Hunt had called it a day as they were apparently off the back of the main peloton, which was being driven by Spain. Kvachuk kept pressing on and survived another lap and a bit. WIth two to go his lead over the 32-rider group was 2-25, with the bunch another 1-05 back. On the climb, Simon Gerrans and Matteo Tosatto drove it hard to get rid of Greipel, the German sprinter. Approaching the top Nibali passed Kvachuk and by the summit he was clear. But he appeared almost surprised at his own strength and couldn’t decide whether to hammer on or wait. He may have been a little disappointed at the composition of riders who came across to him – Sorensen, Moerenhout, Serpa and Visconti. Had Gilbert or Evans joined up, they may have had a chance but with more than 37 kilometres still to go, this was a move doomed to failure. They pressed on and with two laps to go Nibali, Visconti, Sorensen, Moerenhout and Serpa had 22 seconds’ lead over Gilbert, Van Garderen, Pozzato, Poels, Evans, Brutt and Wegmann. Ominously the next group was only another 27 seconds back and that contained Hushovd. Towards the end of that lap, Belgium’s Bjorn Leukemans set a fierce pace on the second and less severe of the two climbs. It was a move design to prime Gilbert, who went hard and got a gap, although he was marked by Pozzato. That dragged a group clear and, for a moment, it looked as if it might be the one. Evans, Gilbert, Leukemans and Pozzato were joined by Niki Terpstra of Holland and Alexandr Kolobnev – twice a silver medallist – of Russia. But as they came into the finishing straight for the penultimate time, they were engulfed by a big group leaving the puncheurs with it all to do again. Marzio Bruseghin of Italy was doing the donkey work and he led the group of 40 into the last lap. Fabian Cancellara was the 41st rider over the line, 39 seconds down, but out of contention. Gilbert attacked again on The Ridge, Leukemans did the perfect job of sitting in no man’s land between his team-mate and the chasers before easing up and making it harder for anyone to get across. Evans and Kolobnev took turns to try to drag it back but Gilbert looked good, with a lead that fluttered between about 15 and 20 seconds. The Italians appeared to have missed out, having made so much of the running, and the chasing was left to Evans, Kolobnev, Moerenhout and the German Paul Martens. A huge turn by Evans, cheered by the Australian fans watching on the big screens, did for Gilbert but also did for his own chances of retaining the rainbow jersey. With around three-and-a-half kilometres left, the big bunch swept past the Evans group and were closing down on Gilbert. Russia’s Vladimir Gusev attacked the bunch, blew past Gilbert and hit the right-hander for home before being joined by Janez Brajkovic and Niki Terpstra. They too were caught before they reached the final kilometre. A sprint was inevitable. In the middle of the bunch at the front, Gilbert refused to give up and launched a long, ultimately fruitless sprint. It was like watching a man trying to run through quick sand. And then came Hushovd with a powerful sprint that was enough to hold off Breschel and Davis.